"All aboard," shouted Craig, the mouse. He was dressed in a conductor’s uniform and sat inside the engine of the tiny train. "Come on, you rascals. Climb on board. There’s plenty of room for everyone," he called. The wee mice stood giggling with excitement. "Can I go for a train ride?" Michael asked his mum. She pushed him on without a word. "Mum, can I go for a ride too?" asked Kirsty. "Me too, Mummie," squeaked Hanna. "All right, lassies. Climb on. You’d better hurry or Craig will leave without you," she urged. All the little mice came running over and climbed on the train. They couldn’t sit still. They were all too excited. The people in the house only set up the train for a week before Christmas. It ran all the way around the bottom of the tree in a big circle. Craig started the train’s engine. It began to chug and move slowly down the track. "Here we go, Hannah," Kirsty shouted to her wee sister. "Hold on tight." The train moved down the track. Chugga chugga chugga chugga. TOOT! TOOT! It whistled loudly, but not loud enough to wake the people up. 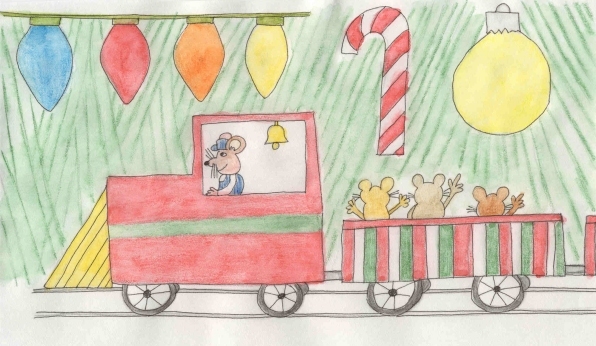 As the train moved, the mice looked around. "Look at the packages," Hannah squealed. "They are pretty." They saw silver boxes tied with red velvet ribbons, gold boxes tied with silver ribbons and even packages with Santa faces on them. "Look at the tree," Kirsty pointed. "There are glass balls. If you look quickly, Hannah, you’ll see your face reflected in them. It’ll look funny!" Hannah looked up. "Here comes a green ball. Look quickly." Hannah started to giggle when she saw her face. It was big and round and her whiskers looked monstrous in size. Each time the train passed by a glass ball, Hannah saw herself and laughed. "What are those?" she asked, pointing at the candy canes. Kirsty explained, "Those are peppermint sticks. They’re very sticky." "I like the lights," Hannah smiled. "I like the blue lights the most." There were blue lights, red lights, green lights, orange lights, yellow lights and white lights. Some of them flashed on the mice as the train whizzed by. Around and around it went, at least a dozen times. All the wee mice had a chance to see everything. At last, much to the disappointment of the wee ones, the train came to a stop. "End of the ride!" Craig shouted. The mice climbed off the train and headed back to their mouse holes. "I want to do that again," Hannah whimpered. "More!" "We’ll do it again tomorrow night," her mum promised. Hannah turned once more and looked at the big Christmas tree. She’d never forget how much fun that was, seeing her face in the glass balls, feeling the warmth of the colored lights, seeing the beautifully wrapped packages, and learning about peppermint sticks. "Good night Christmas Train," she whispered and slipped her tiny hand into her mum’s.